Day 62 - Case halves - TOGETHER! Today, I put one and one together and got.........one? I used two shims to set up my distributor and get that positioned. I installed it and cinched it down. I then aligned the bearings so that they were facing the right direction and double checked the left case half one more time. 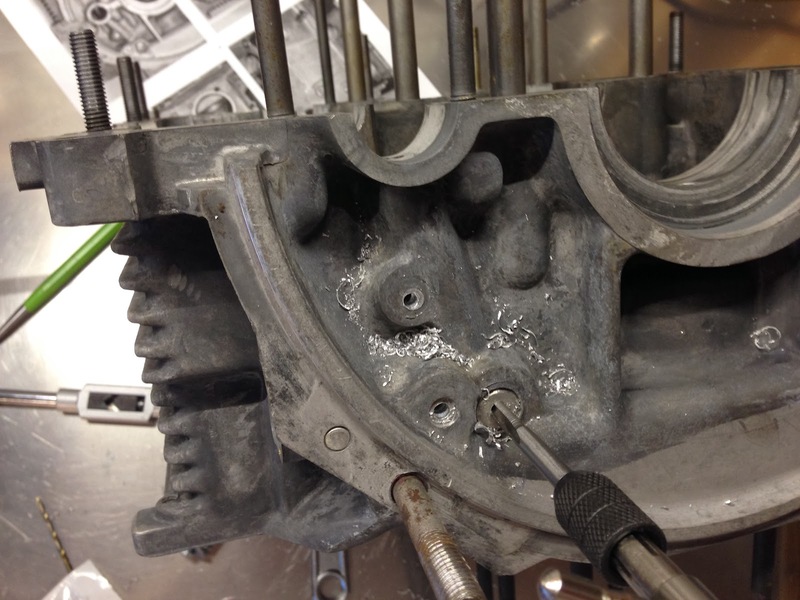 I then laid the crankshaft into the case and had to work a bit to get it to seat properly. 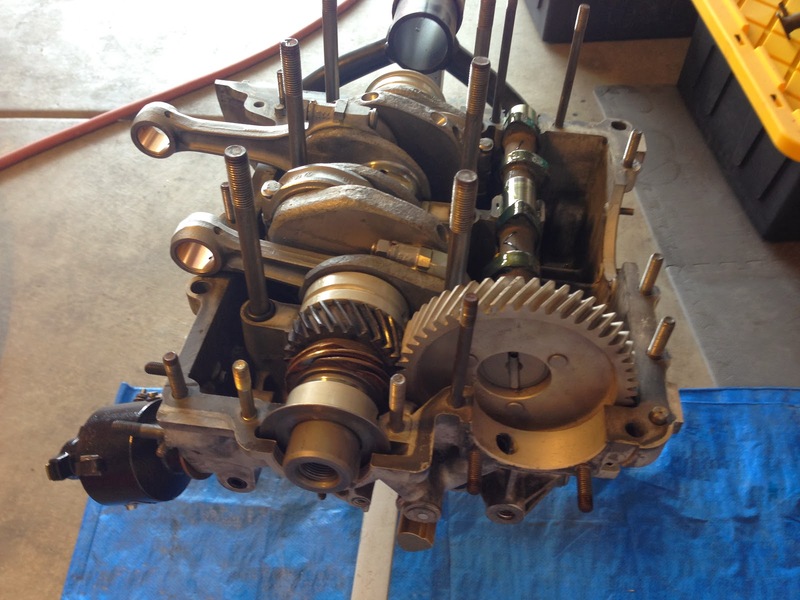 Then, I put the cam shaft in. I checked it for backlash and it was gravy. Lubed up the right side lifters and #2 main bearing. Ta-da! The case is together, torqued the nuts to the appropriate amount. Used a high tech case sealant so hopefully minimal oil leaks! 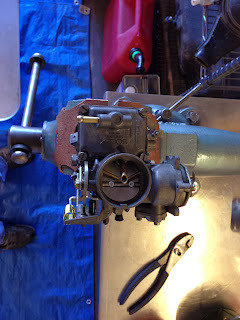 I also installed the oil pump and cover, which you can only see half of in this picture. Cover/gears are missing in this pic. While I was torquing, this stud had me perplexed. It was fully driven into the other side of the case, but I couldn't get the nut to seat firmly. You can see the threads don't go all the way down. After some research, I found out this stud is for a universal fit, and for some engines the intake manifold mounts here. In my case, I am not going to use that mount. 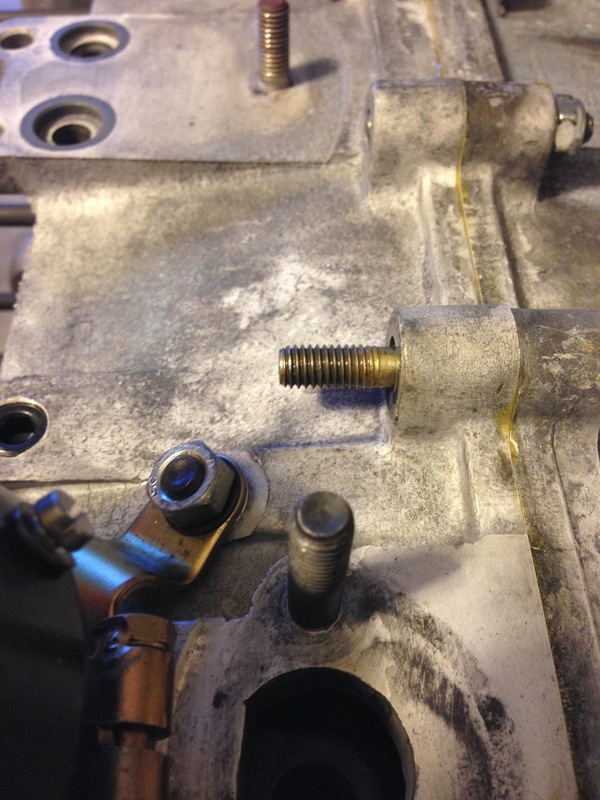 So I took a die and created threads all the way to the bottom of the stud in this picture and I will probably cut off the excess stud once I put the washer and nut on. 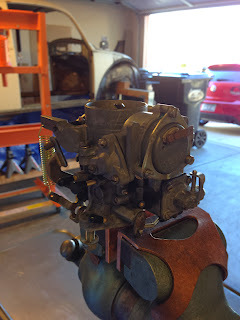 Next work day I hope to get the cylinders on, some of the accessories, and maybe the cylinder heads. 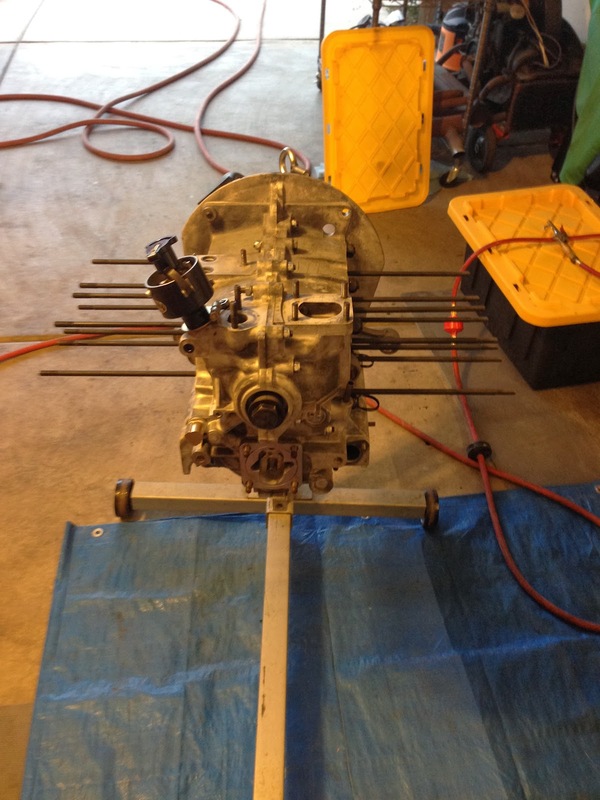 Day 61 - ENGINE ASSEMBLY!!!! Well, the day I've been waiting for a few weeks now has finally arrived. 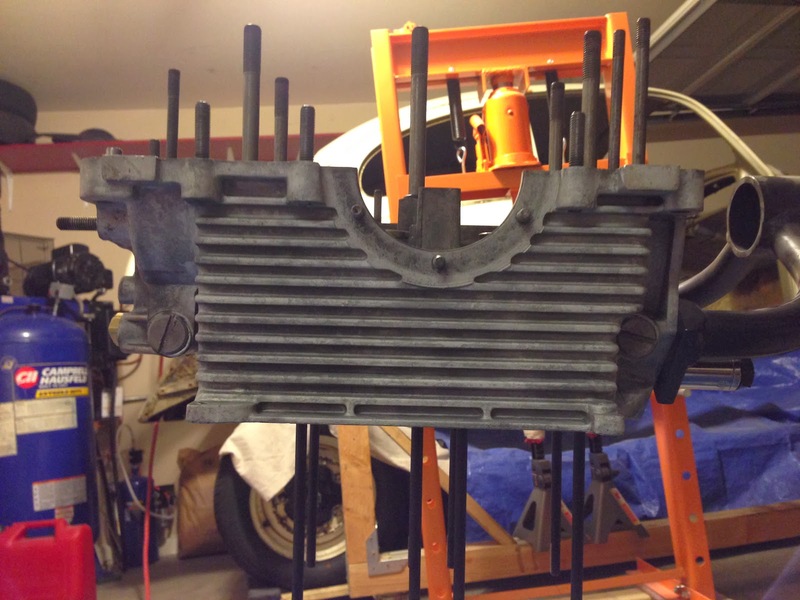 I was able to get quite a bit done on the engine today, am happy with the project so far. Had a few set backs and was forced to a stopping point, but overall not bad! 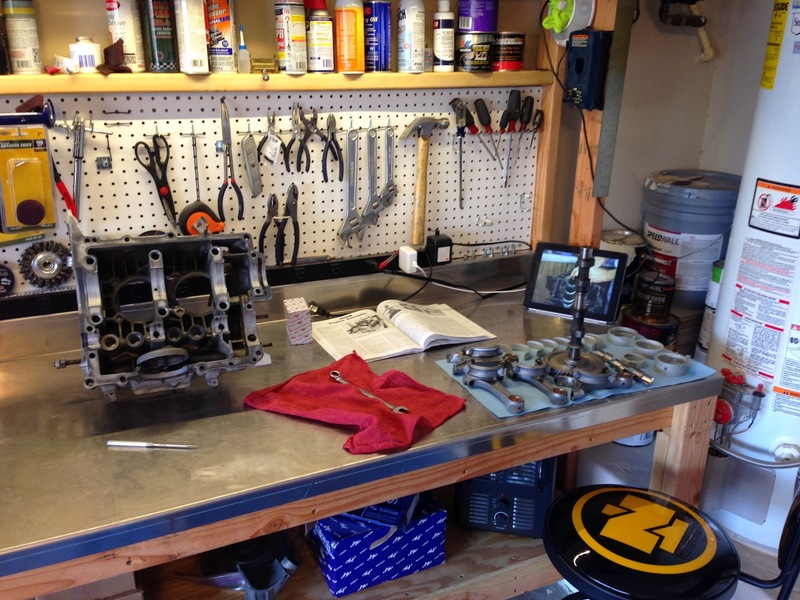 As with most of this engine project, it seems like most of my time is consumed with cleaning. This day was no different. All the internal parts that I cleaned, sent to machining, and balancing had to be cleaned one more time in fresh solvent. 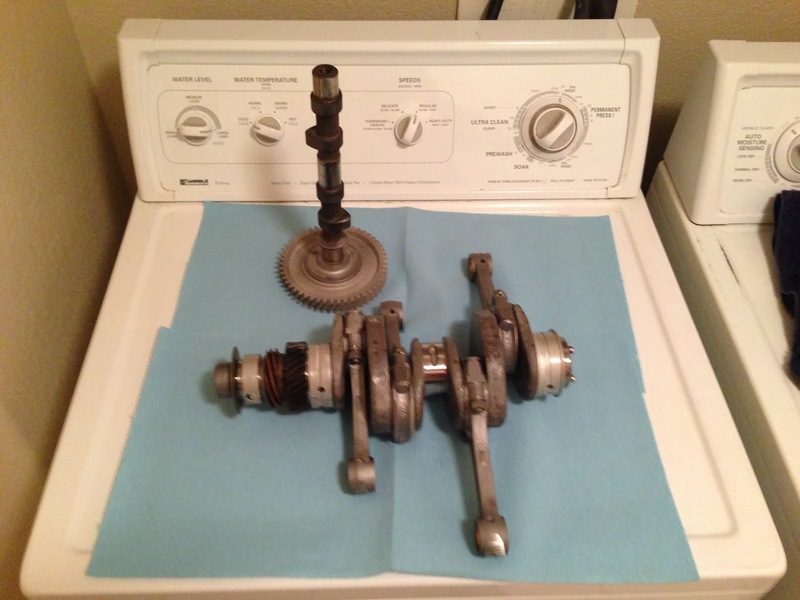 It is amazing how much more oil and grit came off the parts. After that, I compressed air dried them, and then did one more final wipe down "the white glove" treatment with some brake cleaner. All laid out with somewhere to go! 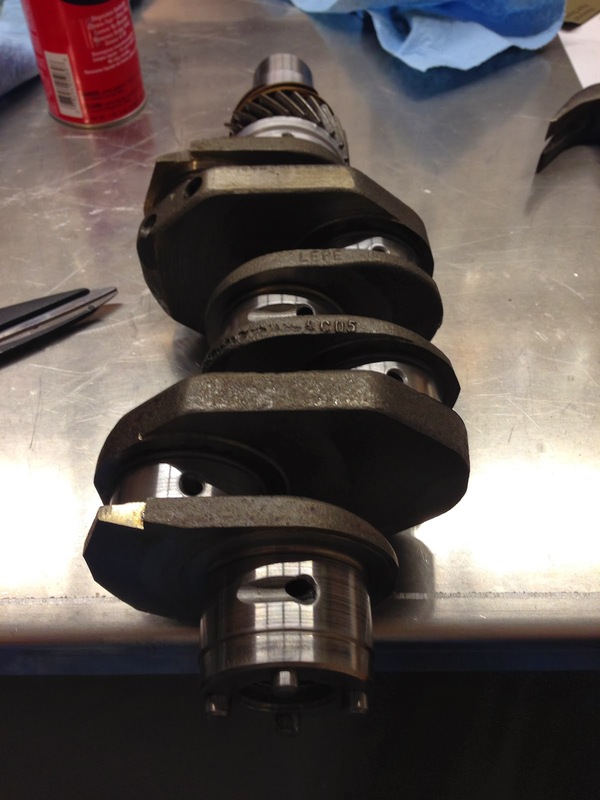 I started with the crankshaft, measuring the tolerance between it and the rods. I checked for side and oil clearances which were all in spec. 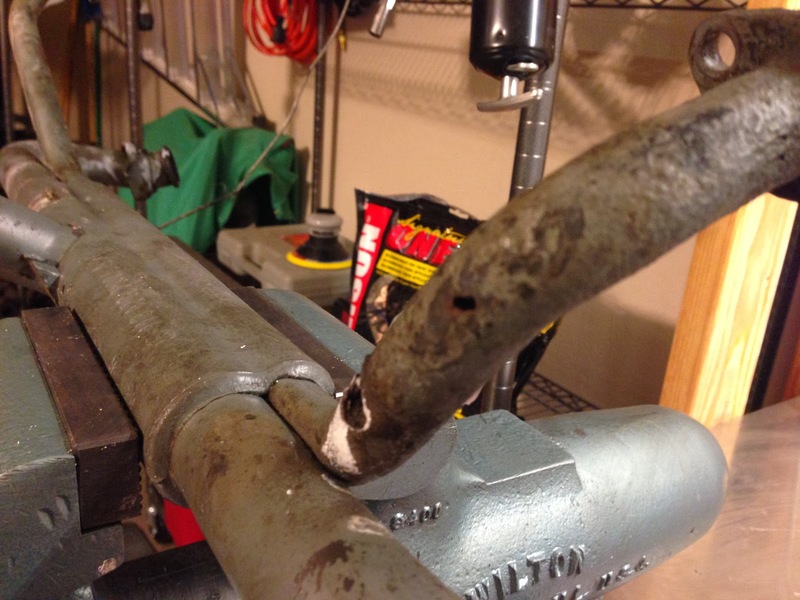 I then installed the connecting rods and used some lock-tite to prevent the nuts from coming undone. It was a tedious process because in actuality I had to make sure the rods were going on the right way, on the right journal, and at the right time. It took 4 hours from the end of cleaning to this picture! I then put the cam bearings in (bottom row of 3 small semi circles in this picture) and the lifters (the 4 full circles in between the cam bearings). They all fit like a dream and glad it worked out. I also installed the #2 split main bearing (the one large semi circle in the middle of the picture). This is the right case half and it is ready to be mated to the left. The left is where most of the action happens though! 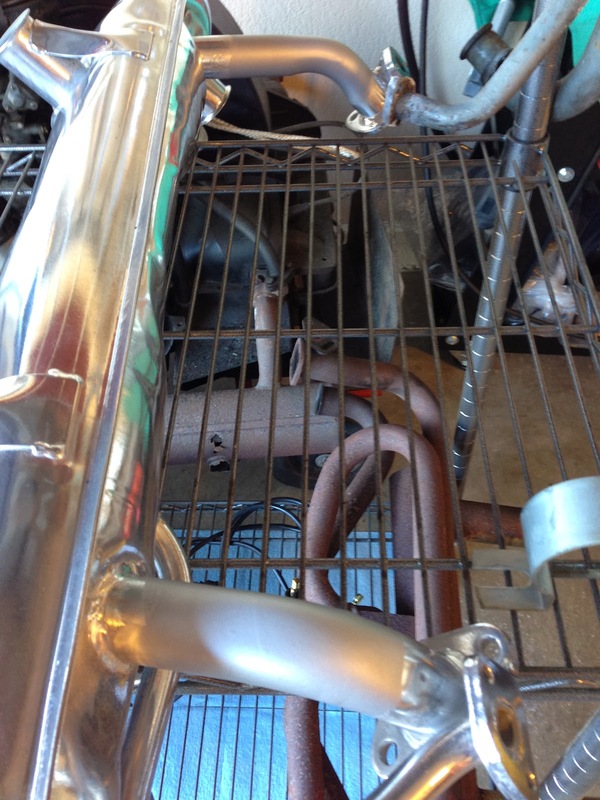 Here is the left half on the engine stand. 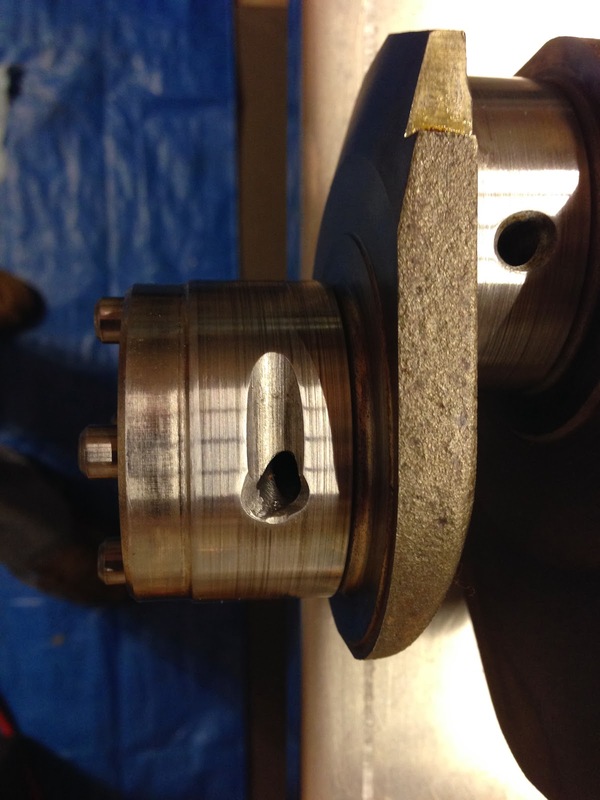 It has identical cam bearings and lifters, but you can see the main bearing surfaces actually have a little dowel pin that sticks up to prevent the bearing from spinning. 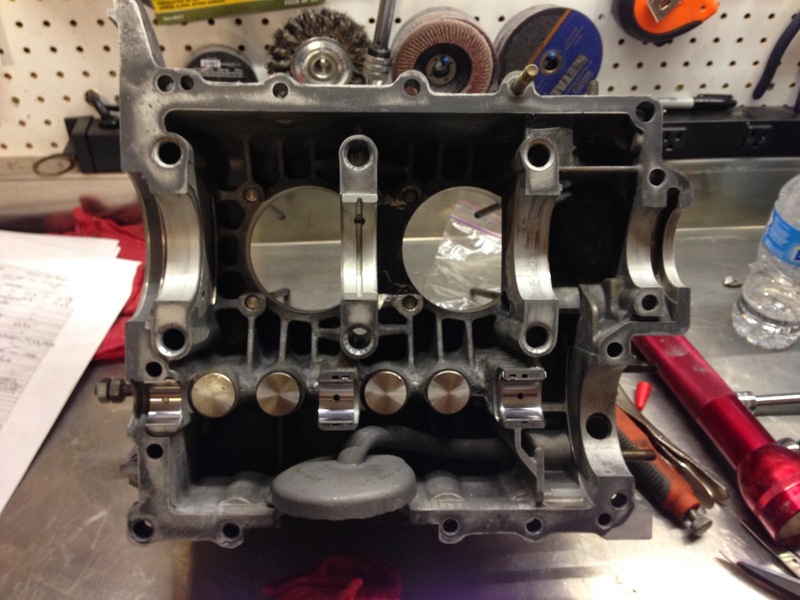 In the picture below if you look on the bottom left and bottom right of the engine case you can see the two circular plugs with a flat screw driver head. These are the oil pressure regulator and oil bypass valves. One of them proved to be a real pain and wasn't moving up and down smoothly in it's bore. It actually got stuck! I used a starter bushing puller I used 10 years ago on the transmission and still had (thanks Dad for the packrat skills!) to fish it out. 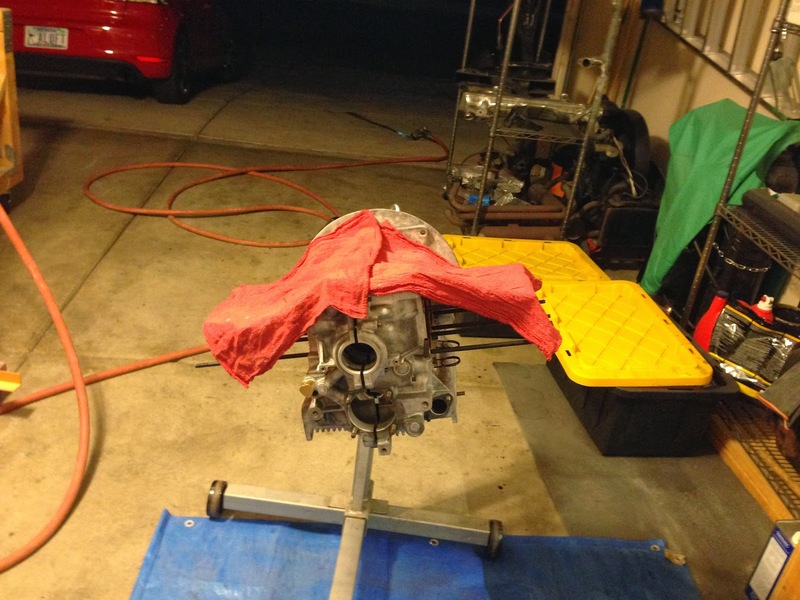 I then cleaned up the bore and it moved freely after some effort on my part. I put the piston in, a spring, and then closed it up with the flat head plug. Basically at this point I was ready to put the crank inside the case, but while setting the end play on the distrubutor drive gear I found that I had too much end play. My clearance was .065" and it needs to be closer to .020". Not a big deal, but I didn't have the proper shims to make it happen. Going to pick those up tomorrow and should be able to press on. I put the two case halves together and covered them to keep dust out. I put the crank and cam inside to avoid excess dust. I also thought about surface rust but humidity may be higher in the house, so probably a moot point. I'm going to pick up a used manifold tomorrow that I can use on my car. It will need some cleaning and painting but should be good to go. 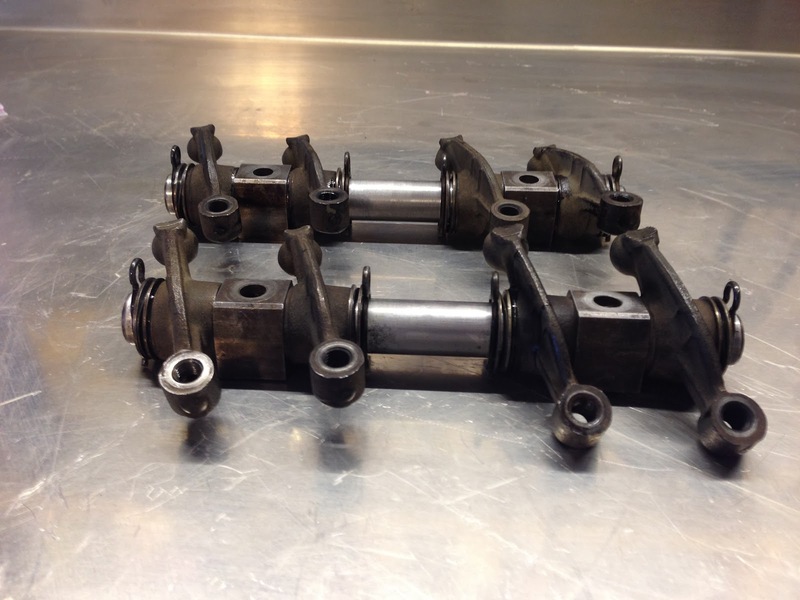 I also am going to get those distributor drive gear shims and also need some shims for my crank shaft to set its end play. I need .004" more to make it juuuuusttttt right. After all that is done, I will double triple check some things, and then put the two case halves together! 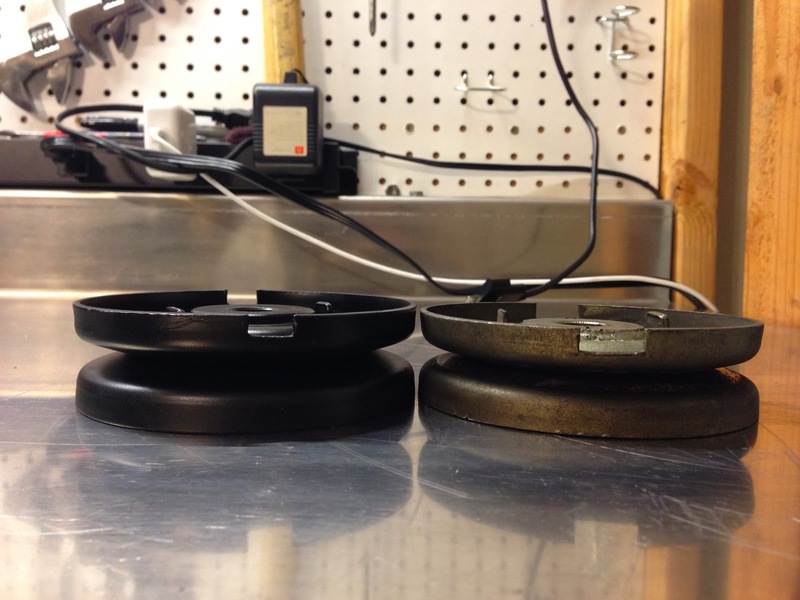 I did some more research and it looks like I will be able to use that "new" pulley I was talking about in the last post. See below. Well I seem to have lost count of my "days" but probably have spent about 12 more "working" days since the last blog entry with a day stamp. So we'll start with Day 60. The last few days have been busy. I have received a lot of the parts I've been waiting for. I still am waiting for my engine tin and odds and ends. 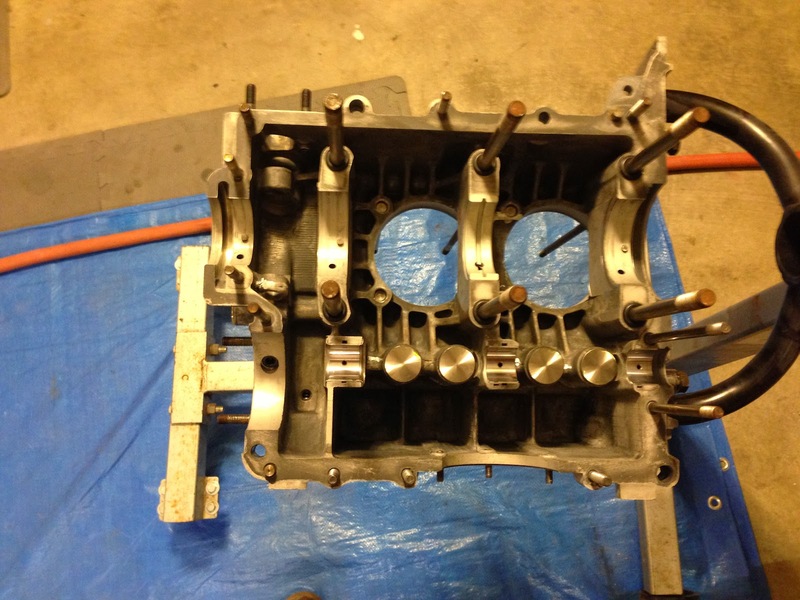 Today I finished the engine case drilling and tapping threads. These are the factory drilled holes that create the oil galleys. They had blank aluminum plugs plugging them up, but since I wanted to clean these out I had to remove them. In the future I may tear down the engine and want to clean it again. So, I drilled and tapped them for threads, put a screw-in plug, and it is easily removable. This process took about 4 hours. Then, I used my new baking soda blaster to clean the outside of the case. It did a great job but made quite a mess in the drive way. No sweat though, wash it down with water and problem solved! 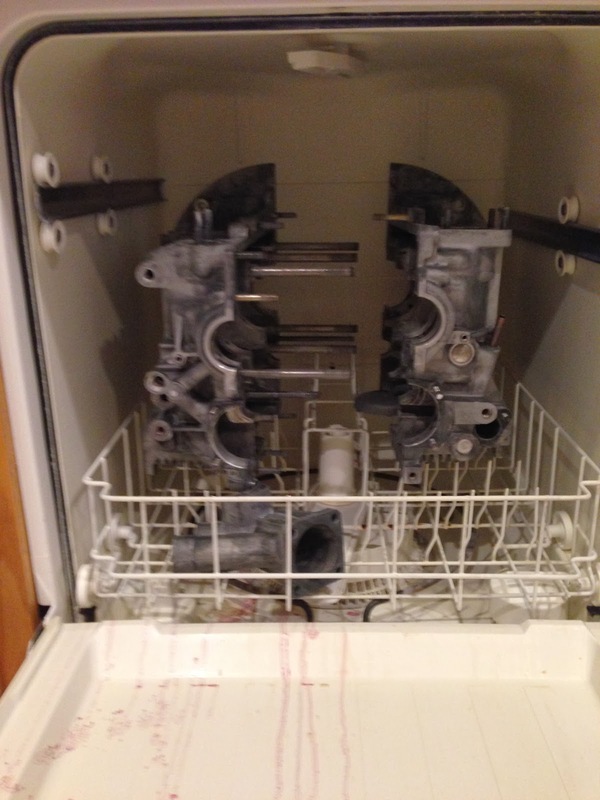 One more trip in the dishwasher and the case will be ready for assembly! 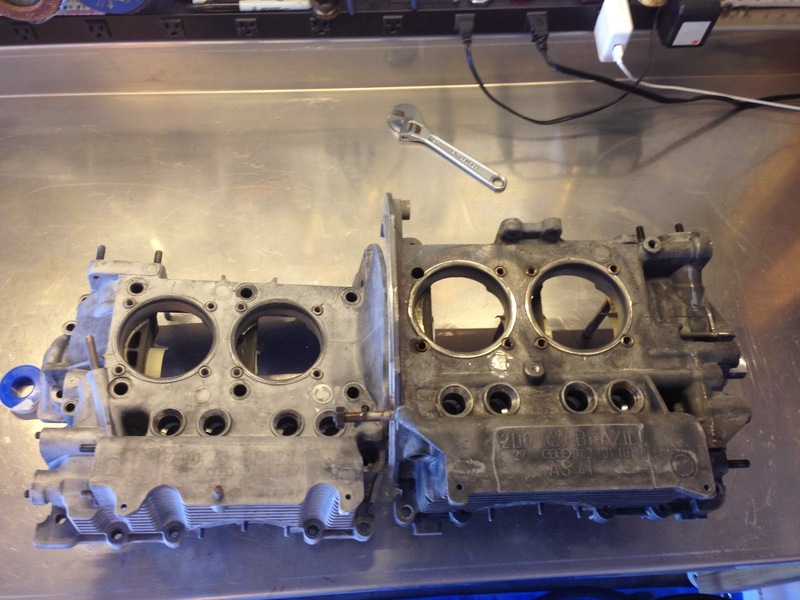 My cylinder heads should be done today and Monday we have a trip to Santa Monica. I'm going to take my engine parts with me, rent a car in Santa Monica and drive the 1 hour to pick up my heads and drop off my engine parts that are going to get balanced. Finished some projects, waiting on others! Well, I finally finished some projects. The first was the new exhaust I had. It had clam type heat exchanges over the top exhaust pipes which I won't be using (I'm not installing cabin heat on this engine). Rather them be on there and serve no purpose, I removed them. Unfortunately, the ceramic coating that the muffler was bought with didn't reach the areas these clam shells covered up. No big deal, I sprayed some at home ceramic and was going to bake it in my oven. The new paint is the slightly duller stuff on the two pipes. Unfortunately, the oven was too small and I couldn't bake it! No worries, the can says after the first few uses on the car, that the ceramic paint should set. I also have spent this entire week, cleaning and scrounging for the various things I needed to restore the old carburetor...the one I'm not even using! But it was good education and now I have a fully functioning backup carb should I need it. The parts are organized and waiting. Top shelf is body parts. 3rd shelf is ready to go engine parts. 2nd shelf is parts I still need to figure out/order. And bottom shelf is all the stuff I am not going to use, but don't want to get rid of just yet. I'm ready to start the engine build but I am still waiting for the aluminum plugs so I can plug the oil galleries. They are $15, ordered December 26 and still not here. If they don't arrive this week, I will probably get a little fussy! 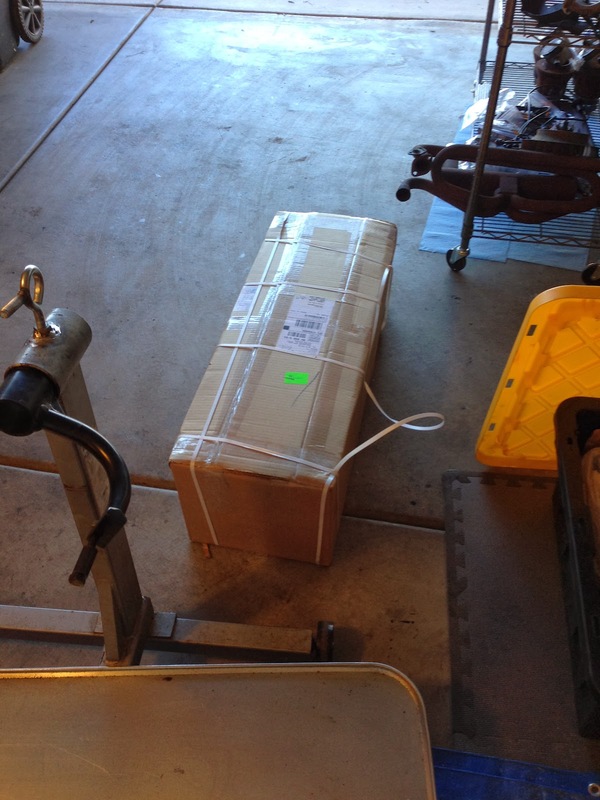 Today, I got some more parts shipments! These are always fun to receive because I get to see why my credit card statement is always higher than I'd like. I got a large parts order that had most of what I need to finish the engine. 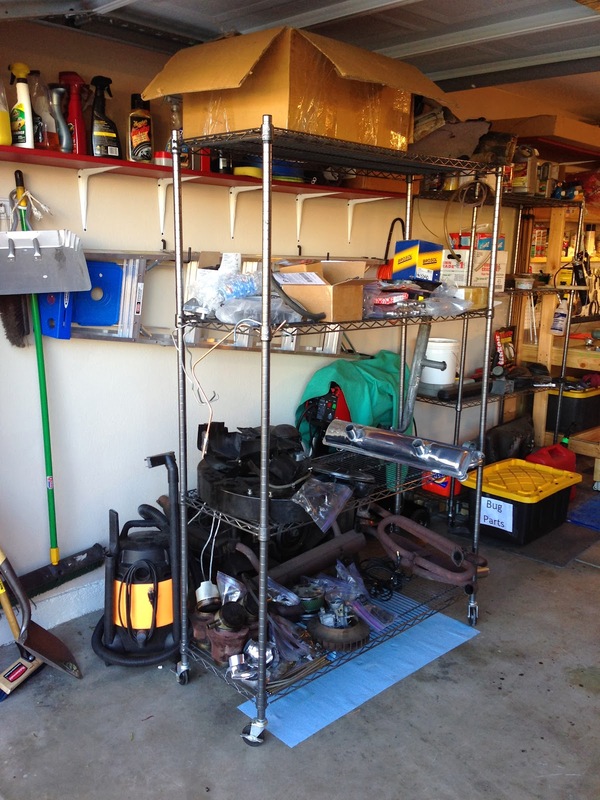 Exhaust, gasket kits, internal engine parts, and some tools. I also got my carburetor, oil cooler, and some other odds and ends. I'm just waiting on small things here and there to complete my assembly items. Not that it really matters, because I'm still waiting on my plugs for the oil galleries (shown in the last post, first image). Those should be here in the next few days. It's all about timing. The last major thing I need to order is the engine tin. This ducts the cooling air (VW's are air cooled, not water cooled like almost every modern car) around the important parts to keep it running smoothly. I am looking for original tins as they fit better. I was going to go with powder coated tin, but the $800-900 price tag has me a bit in shock. 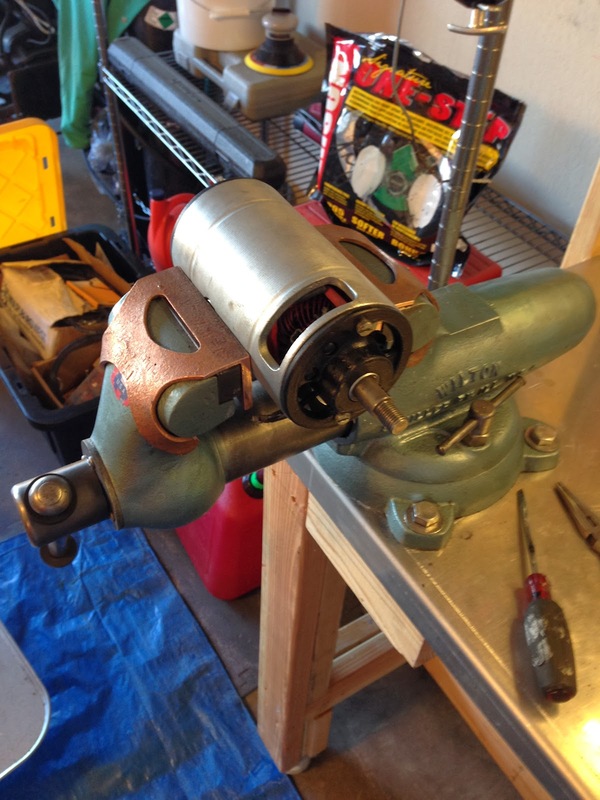 I can find the tin I need, modify it for my application, and paint it (will need some more tools, OH NO!) for probably less than that. Paint is also the original finish on the tin and easier to repair if need be in the future. I cleaned an original style air cleaner I bought. It will need some sanding, some dent repair, and a paint job and then will be ready to go. I have another on the way so between the two I should be able to piece together one good one. 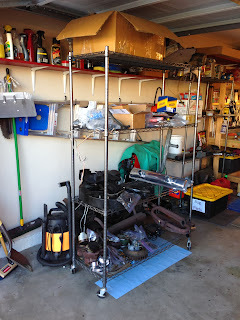 I also cleaned up my generator, removing all the pieces, cleaning them, and then re-assembling. Shiny and new! 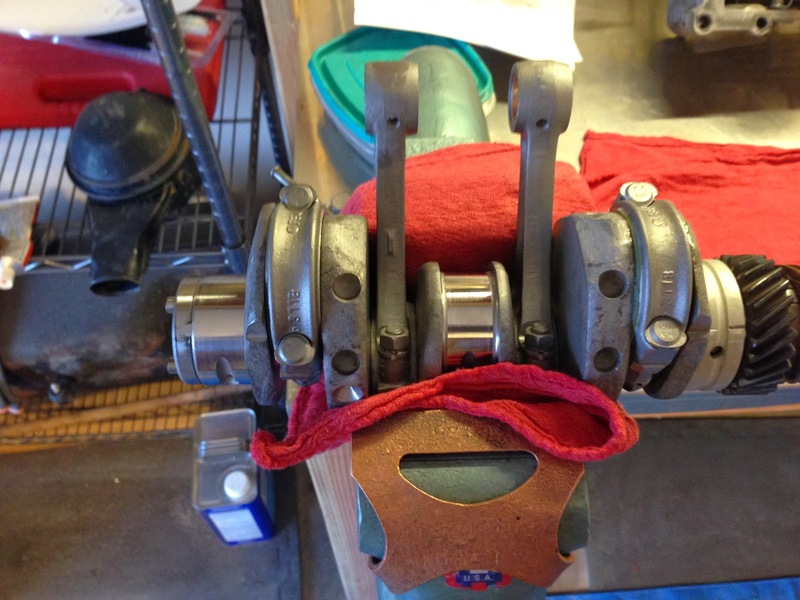 You can see the copper jaws I added to my vise to protect parts from being marred by the steel teeth. And I cleaned up and listed for sale some of my parts from the old engine that I don't plan on using. They aren't useful to me anymore so I either list them or keep them...and I don't want to just have things to take up space...where I could put another VW! Well notable progress has been slow as I have ordered a bunch of parts, waiting for them to arrive and also cleaning parts. 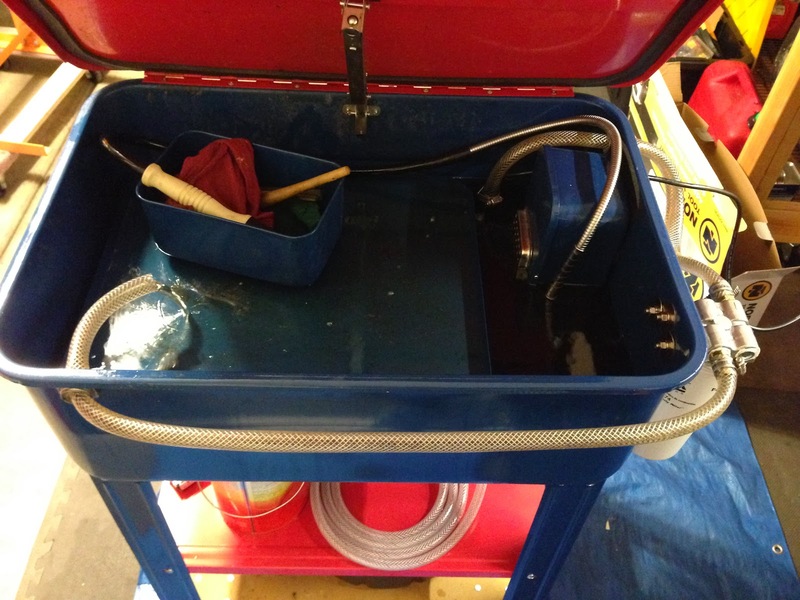 I have prepped the case, ready to tap and plug the oil galleries. I unplugged them so I can rush some brushes through the "channels" to clean them out. Then I'll put threads in the holes and put aluminum plugs inside. The case did have some slight issues. 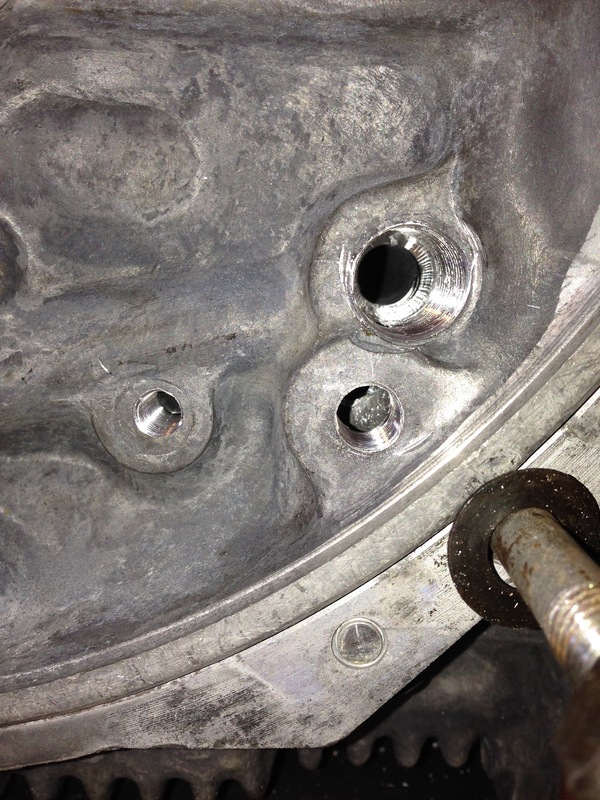 This bearing seat had a split in it so I took a Dremel to it and removed the small piece. I then filed it smooth and everything is good now. Here's the crank. Not bad, but not good. It's a cheap China cast crank. Not original German. 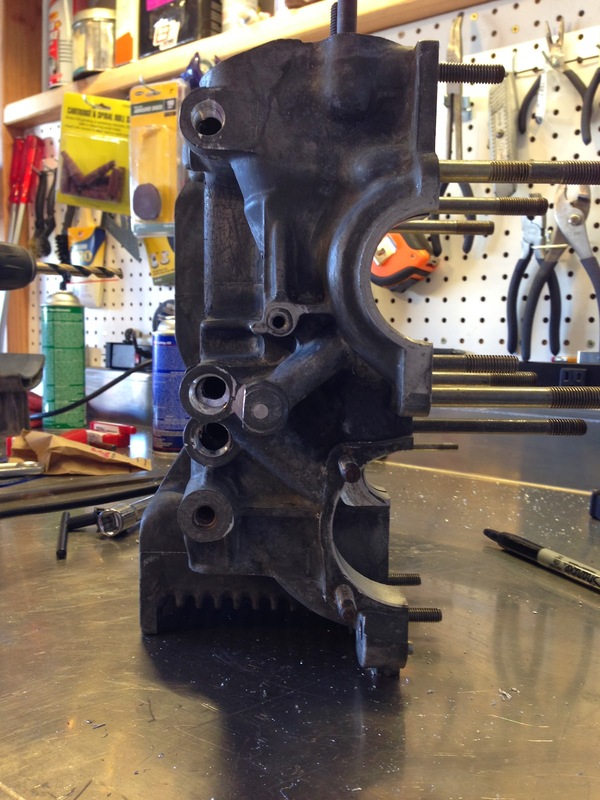 But I did buy a re-manufactured German forged unit to replace it. 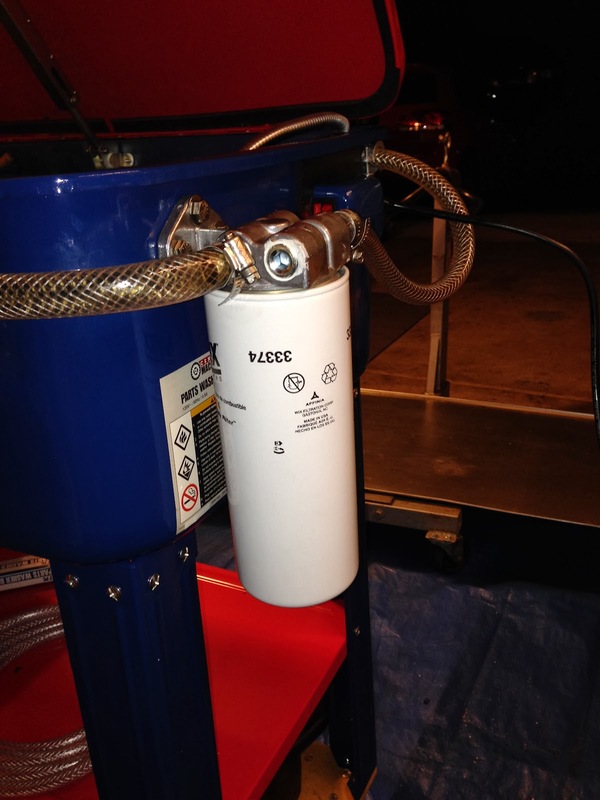 Here's why I am adding an external oil filter (the original car never had one). 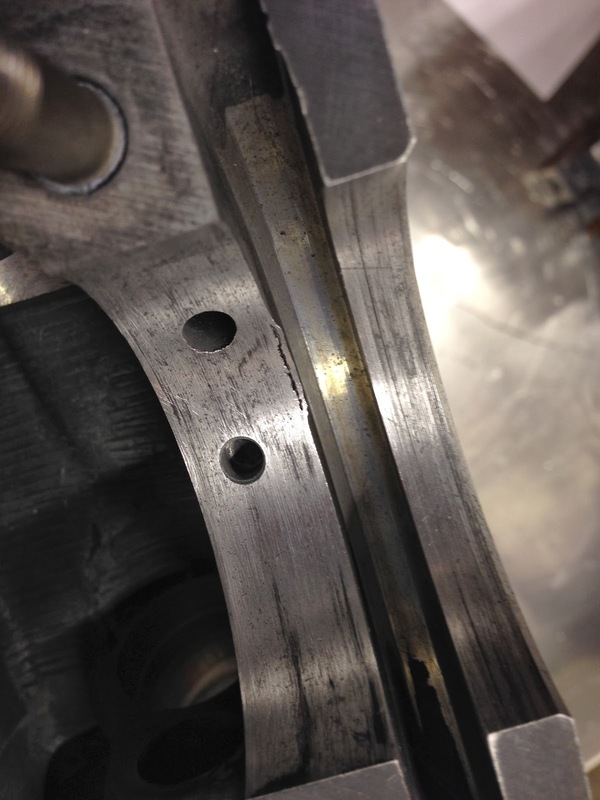 These bearing surfaces are rough due to dirt in the oil. 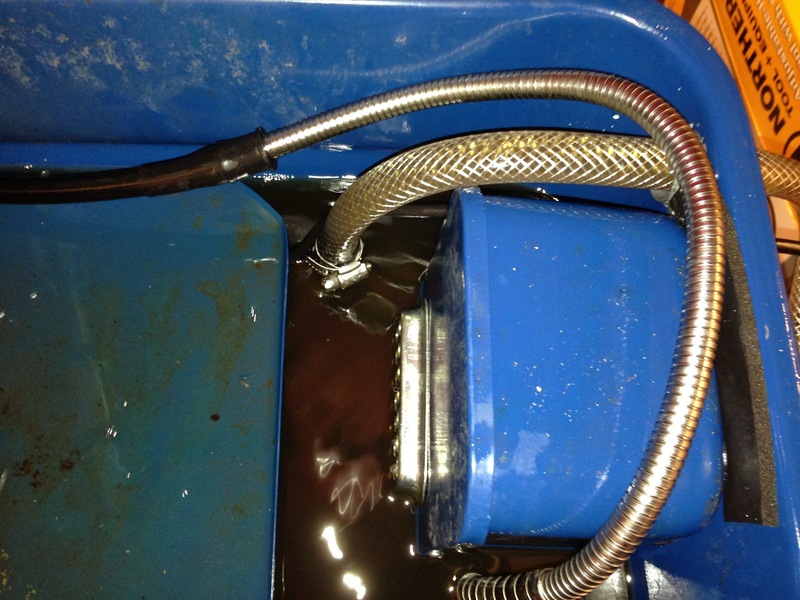 The crank would have to be ground down to be usable...bought another one instead that is a better unit. Not worth putting money into this cheap crank. 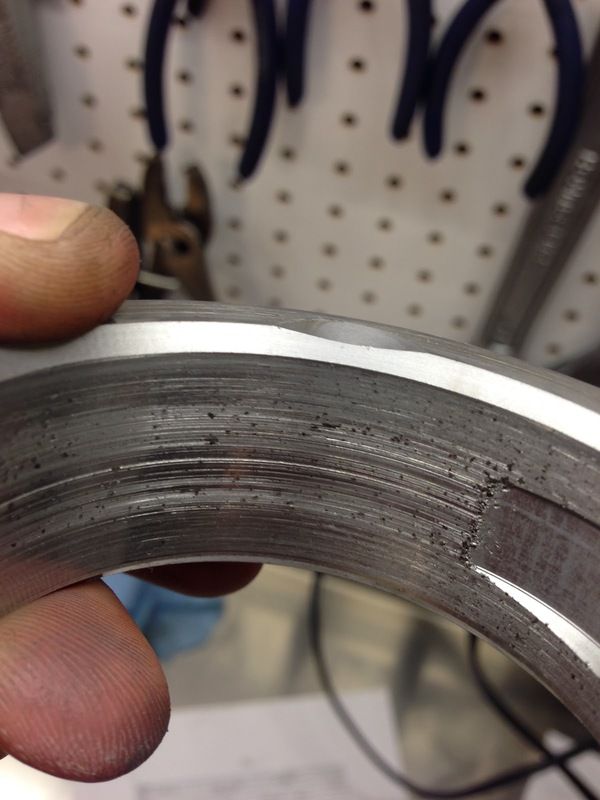 What the bearings look like...again scoring from dirty oil. 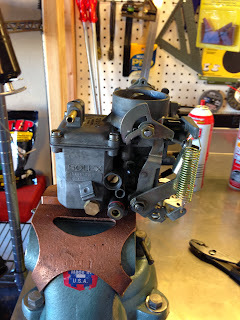 Here I am trying to clean out the heat riser that supplies hot air to warm the carburetor to prevent carb icing. It has a hole in it and I can't get it clear...so it is probably a junker. Looking for another one. 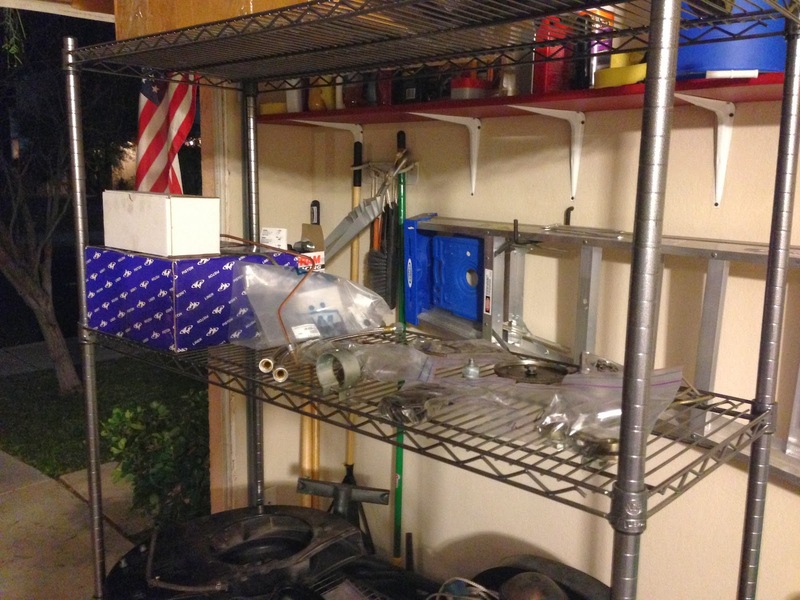 This is the ready parts shelf. 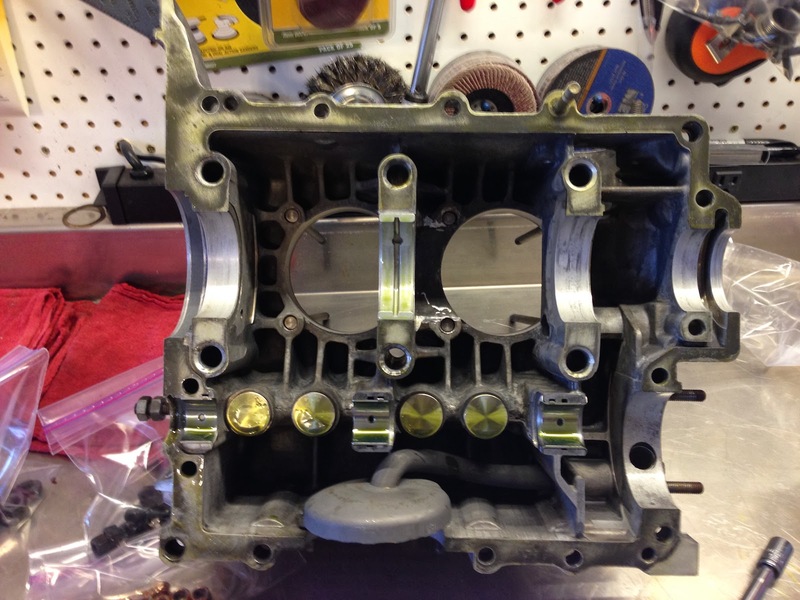 Pistons/cylinders in blue box and new connecting rods in the white one. A bunch of other smalls ready to go. 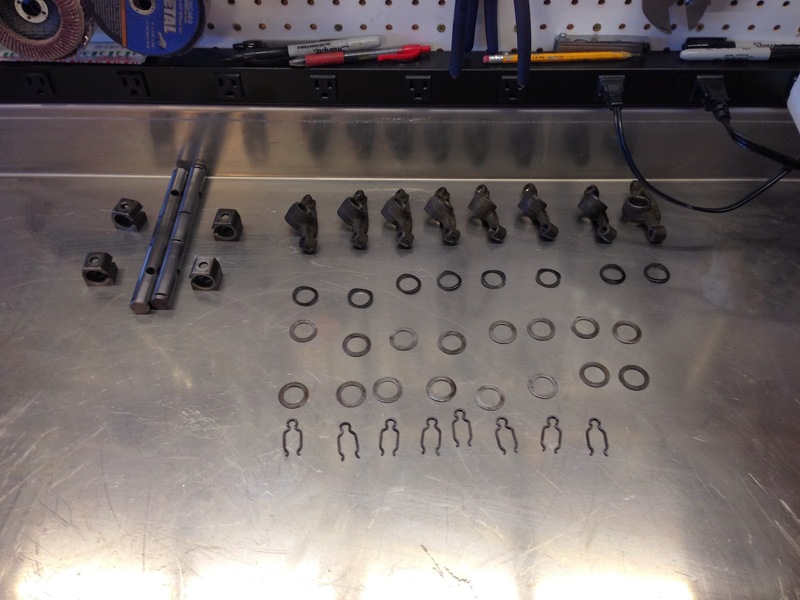 Rocker arms disassembled and cleaned. 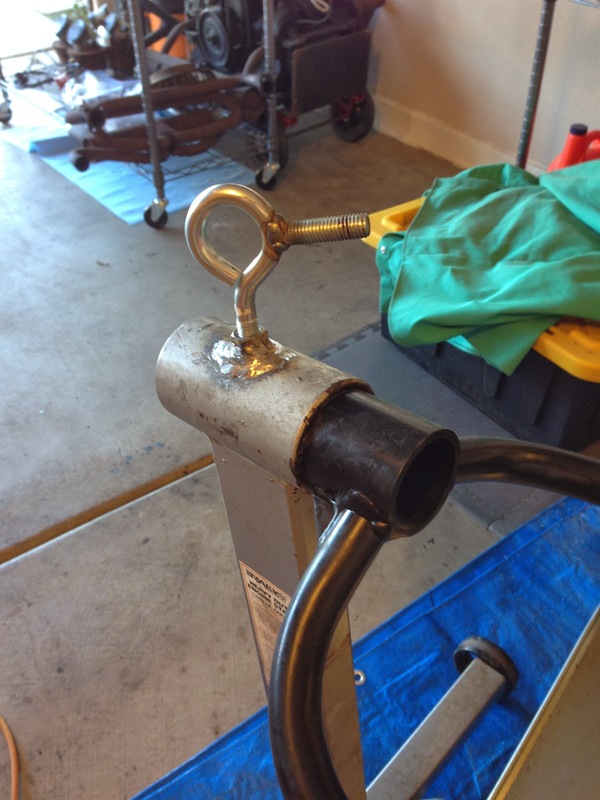 And finally today I welded on this eye bolt and extension in order to secure the engine when it is on the stand. When I was taking the engine apart it kept rotating with was no good!